Also wrestled as Ede Ebner. Ede Virag is listed as one of the best amateur wrestlers from Hungary. 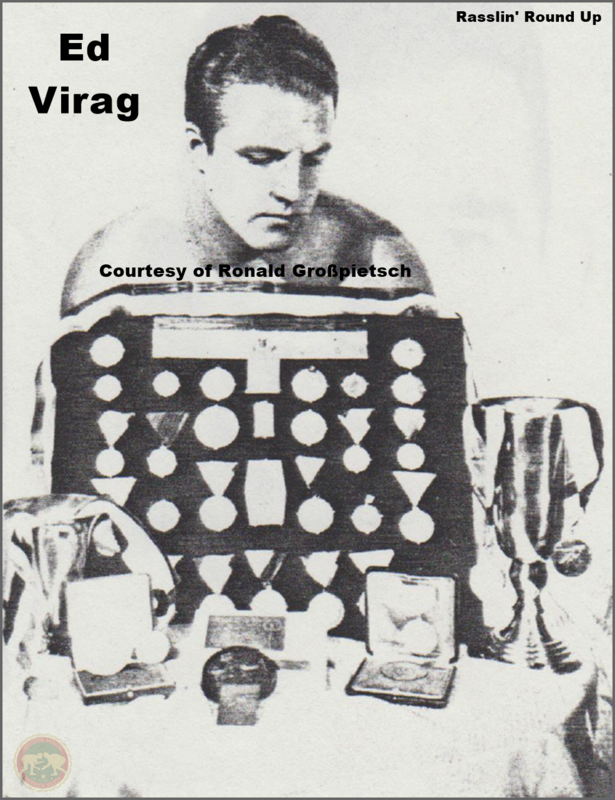 The Hungarian Amateur Wrestling Association nominated Virag to become a member of the 1936 Hungarian Olympic Wrestling Team for the Catch-as-Catch-Can style. The Hungarian team won overall with seven wins to none. It is announced in a newspaper here that Ede Virag will go to the Olympic Games in Berlin, Germany. Dunn remained in the competition, needing to be thrown again for elimination. 1. Kristjan Palusalu (of Esthonia). 1. Knut Frideli (of Sweden). 1. Frank Lewis (of USA). 1. Karoly Karpati (of Hungary). 1. Kustaa Pihlajamaeki (of Finland). 1. Oedon Zombori (of Hungary). First Place - Four Times. Second Place - Three Times. Third Place - Three Times. In today's issue of a local newspaper it is said that Ede Virag has turned professional after signing a contract to appear at the next tournament in Budapest, Hungary. This is a part of the tournament which started on June 30, 1938 and finishes on October 6, 1938.